Biloxi, Miss. – Another reason to decrease the amount of fuel we use: 25 percent of America's oil comes from off-shore Louisiana oil rigs, from which Louisianans get no taxes (it goes entirely to the federal goverment). And Louisiana is the second poorest state, after Mississippi. The focus of my thoughts today is Glenn, a seven-year-old at art camp, where I spent the day rotating through five hourlong crafts activities. I felt really needed in only a couple of the classes, but in the other three, I made the most of my presence. I took to one-on-one mentoring Glenn, talking with him, asking him what he thought, trying to convey the concepts that he didn't understand, and giving him tasks that he could do. And we had fun tossing a Frisbee—Glenn has a great throw for a seven-year-old! So it was a surprise when Glenn's father arrived—late—to pick him up and I saw Glenn instantly become a quiet, somewhat spacey child. I can't help but think of the book Dibs In Search of Self by the psychologist Virginia Axline. It's about a child who is diagnosed as probably autistic, but as Axline works with the child and grows his confidence, she determines that the parents do not act as if they love their child. I hope someone loves Glenn. Dinner at Hands On headquarters every evening brings almost everyone living there—short-termers, medium-termers, and long-termers alike—together. At the end of announcements, we recognize the volunteers who are leaving. Tonight, we said goodbye to a young man named George who was departing after 8 months of volunteer work and who without question had touched many souls. I feel honored to have heard and witnessed the volunteers' thoughtfully articulated words and emotions conveying love, compassion, thanks, and awe to this young architect/builder. There are so many wonderful people in this big, bad world, and I'm grateful for the opportunity to have even a little bit of their time, even though I never knew George and only got to hear the stories about him. House 2806: One of many places the Dartmouth team worked in Biloxi. Photo: Adi LaBombard. 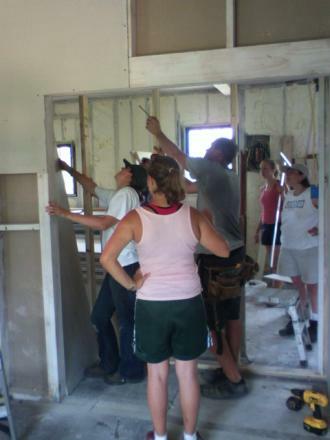 The saying "measure twice, cut once" will always have special meaning for Adi after her crash course in drywalling. Photo: Adi LaBombard. not to pack a lunch.I was on the "Construction with Doug" team, and as soon as he called us together, we packed up the vehicles and set out for Gulfport, an area about 25 minutes from Biloxi that had also taken a hit from Katrina. Construction work was as educational as it was hard-workin' fun. We worked on House 2806 in Gulfport, which is one of several houses on a land trust. Doug explained that land trusts help promote home ownership in impoverished communities by making affordable housing available to low-income residents. The goal is to reduce land loss via abandonment or foreclosure by the state that might result from poverty or a natural disaster, like Katrina.To accomplish this AND keep costs low, a land trust organization retains ownership of the land a house sits on, and constuction of and repairs to the houses are done by volunteers using recycled materials whenever possible. The interior of House 2806 had been badly damaged by Katrina. As part of a great team of Dartmouth and other Hands On volunteers, I spent the day removing old dry wall and pulling nails out of walls and out of molding so that it could be reused, and I even had a crash course in drywalling. No question, the saying "measure twice, cut once" will forever have a special meaning for me. After a long day of work and a great dinner by Ana, the Dartmouth team's fiesty and fabulous cook, I managed to corrupt a few more team members into checking out the Pub.